The DOH Advisory Council (AC) for the implementation of RA 9502 (Cheaper Medicines law of 2008) has already met twice this year. The second meeting was yesterday, but I did not know these meetings as I received no invitation. I only received the three documents for comments by the AC members: (1) "Declaration of Conflict of Interest" form, (2) Draft DOH Administrative Order (AO) on the constitution of the AC, and (3) Draft AO, Regulating the promotion and marketing of pharma and medical devices products. The AC Secretariat noted this and promised to invite me next time. Here are my comments to those three documents. 1. On the "Declaration of Conflict of Interest". This was corrected earlier, during the AC meeting about two years ago when USec Mads Valera was presiding, to make it "Declaration of Interest". A "conflict of interest" connotes a negative meaning while a simple "declaration of interest" and affiliations will be more neutral. For instance, pharma companies, innovator or generics, have the interest of selling more of their products, whether heavily advertised or not, whether endorsed by physicians or not, and so on. The same can be said of the drugstores and pharmacies. Physicians and pharmacists have the interest of giving healthcare, particularly giving effective and safe medicines, innovator or generics, expensive or cheap. The most expensive medicines are those that do not work, even if the price is only P1 but if it is substandard, or triggers allergies and negative side effects to the patient, in effect it is an expensive medicine. It will invite new treatment, new medicines, new diagnostic tests, new physician pf, etc. Consumers and patients have the interest of more choices, more options, among the different medicines, treatment, drugstores, clinics, hospitals, physicians, etc. If a doctor is expensive but he/she can make the patient get well the soonest possible, in effect he/she gives good value for money, "cheap" service. 2. On the draft AO constituting the AC. a. For the nth time, the DOH and the rest of us should STOP using those terms MDRP (and GMAP). 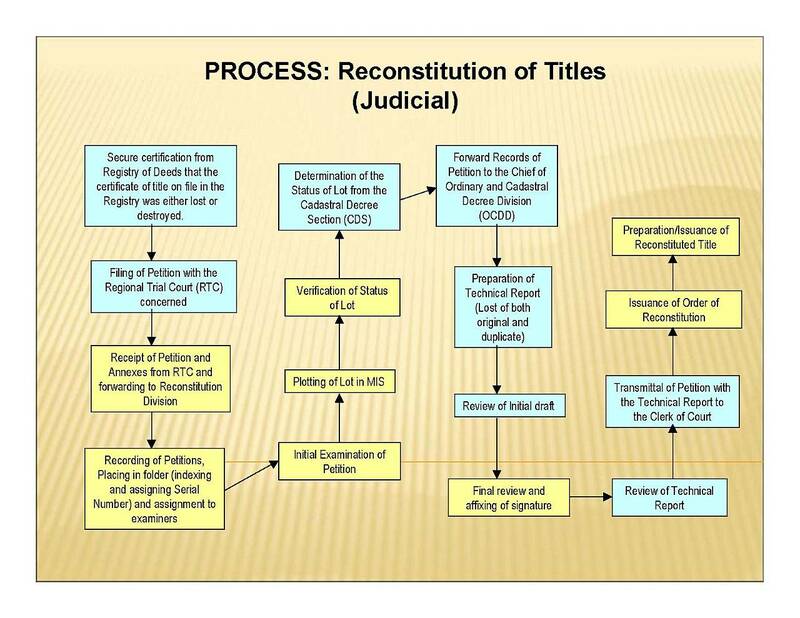 These are illegal terms -- not in RA 9502, not in the implementing rules and regulations (IRR) of the law. What is clearly, explicitly, categorically stated in RA 9502 is MRP, maximum retail price. 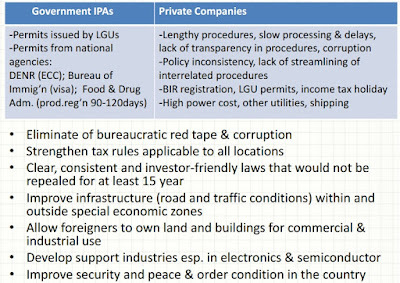 MDRP and GMAP are political inventions by the DOH and DTI (under Secretaries Ona and Favila, respectively) during the last few months of former President GMA. GMAP is subliminal for Gloria Macapagal Arroyo Price, and not really Government-Mediated Access Price. MDRP was invented to deflect calling MRP as Mar Roxas for President because then Sen. Mar Roxas was being desperate to be pro-poor to improve his low ratings in the Presidential surveys in 2009.
b. On Specific functions of the AC. RA 9502 is first and foremost, an amendment to the Intellectual Property Code (IPC) to allow TRIPS flexibilities and hence, institutionalized the possible imposition of IPR-busting policies like compulsory licensing (CL), special CL, parallel importation, etc. Price regulation is just an "add-on" chapter in the law, not even in the original draft bills. But IPR policy review of the AC is not mentioned in the draft AO. So I propose that IPR Policy review should be #1 under Specific functions, #2 is Price regulation, #3 is Ethical marketing practices. Even if no CL application was ever made since the law was enacted in 2008, according to IPO and Atty. Gepte, it should be in the draft AO because IPC amendment is the main spirit of RA 9502, not price control/regulation or regulation of pharma marketing. c. Members of the Council. I am honored that Minimal Government Thinkers is still granted a slot in the AC despite the fact that MGT is the smallest unit or institute of all the members. It is not even a health-focused think tank as its core advocacies are small and limited government in general, small/few taxes, free trade, rule of law, individual freedom. Now if there are proposals to remove it from the AC because of this fact, I will not object, nor will ask who propose it. Not that someone is proposing this, but am just trying to be consistent. If I have some questions about the AC or its functions, I am also open to be questioned about my participation in the AC. 3. 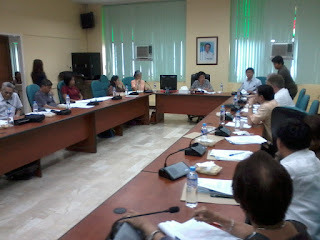 Draft AO on Regulating promo and marketing of pharma and medical devices. Being a non-lawyer and non-regulator, my patience for long docs like this 18-pages draft AO is short. Personally, I would wish that ALL sectors and players should have their own respective Code of Ethics or other forms of self-regulation, with own set of penalties and punishment to erring members. How many pharma companies in the PH, how many wholesalers and drugs import distributors, how many drugstores and pharmacies, how many hospitals and clinics, how many physicians, nurses, pharmacists, etc.? Tens of thousands I would assume. The DOH and FDA have the energy, manpower and other resources to monitor all of them for compliance or violation? I seriously doubt it. A better approach is self-regulation, self-policing. Then DOH and FDA will only monitor those industry associations, professional organizations, etc. If these civil society organizations do not do their work in penalizing non-compliant players and professionals, DOH will sanction them and their officers. This is a party-spoiler proposal. After so many meetings and discussions in crafting that document, I will simply propose the above. So I do not expect the above proposal to be adopted, but only floating the idea, and to ask the various industry and professional groups to do it on their own, self-policing, parallel with DOH/FDA monitoring work. Everything is evolving, so that in the future when the finalized AO will need revision, the various civil society groups have already done their homework and are more ready for self-regulation. A friend who is still enamored with the idea of more government regulation of markets, Floro Francisco, had a little shock of his life when he experienced government bureaucracies first hand. He posted this yesterday in his fb wall, reposting with his permission. Thanks Floro. The images I got from the web and just added them here. Whew, just got back from following up documentary requirements from the BIR, Municipal Hall and the Register of Deeds for the transfer of the land title under my name for a piece of land I bought. Wow so many requirements I had to accomplish and the funny part is I have to submit almost similar requirements to 3 government agencies. And boy the amount of taxes and filing fees I have to pay was a bit shocking: 6.0% for Capital Gains Tax, 1.5% for Documentary Stamps to be paid at the BIR based on the purchase amount of the property. And then you pay also 0.50% for the Transfer Fee of Title at the Munisipiyo. And then another > 1.0% approximately to the Register of Deeds! On top of these you need to pay the Munisipiyo for a certification of your Tax Declaration and another certification for the Tax Clearance and yet another for the Certification of No Development on the land. And you do not get to know all these payments on the first day you visit them unless you get or better yet make a checklist of the 3 agencies of government. You also had to pay for a Certified Xerox Copy from the Register of Deeds for the Duplicate of the Land Title even if you have a copy of the original owner's duplicate. It is painstaking hard work and patience. If you play fair like me and do not go through the channel of experts and facilitators lurking around. You might need several months to complete these tasks. If you are not intelligent and ask the right questions to the right people, may be it would take you a year or two to finish everything only for a small piece of land. What if you lacked communication skills and knowledge about documentations? I wonder what happens to the lowly farmers who inherit or buy lands and the agrarian reform beneficiaries who had to deal with such government requirements to get their names on their properties. I think I should find a politician or become a politician myself to push for reforms in such a bureaucratic mess! No wonder many lazy inheritors just leave their properties to be taken over by knowledgeable government officials and politicians! I think there is injustice there somewhere in terms of the amounts to be paid and the processes to be followed as well as the volume of documentary requirements. 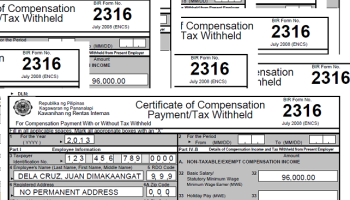 Yung ibang maliliit pampa-xerox lang eh wala na, yung pang taxes and processing fees pa kaya mabayaran nila? Some progressive form of taxation in this regard is much needed. 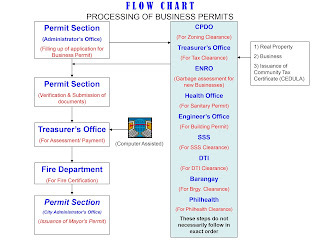 A one stop shop processing system that would simplify the procedures need to be pushed! I am actually about to go through the same process for some properties we inherited from our parents and Sister which remain un-acted upon for years since they died because I nor my brother had the material time to do it. It may require that I take a leave from work to attend to these! Ah Bureaucracy! I wish I was born to a Dynasty! … Ironically in my case mas nahirapan ako sa BIR kung saan mas maraming requirements at mas mahal ang bayarin! 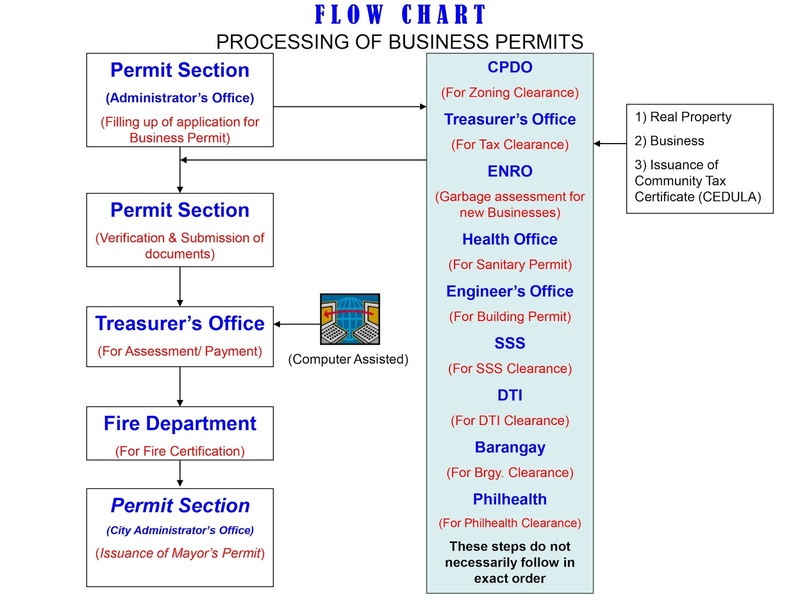 Also now you have to be computer literate to deal with BIR kasi you have to fill e-Forms sa eBIR. Paano na ang ka-awawang Magsasaka! Mas madali sa Register of Deeds! Kaya lang yung IT fees nila mahal! Pero tingin ko diskarte sa itaas yung IT Fees At sakop lang ng isang private servicing company yan kasama ng ID system ng SSS, GSIS at Pag-ibig pati ang Drivers License! 1. may bibilhin govt sa amin (lupa) na maliit lang naman, gagawin service road.. kaso mas malaki daw yung tax na babayaran namen compare sa ibabayad nila.. take note, hindi pa nila nare-release amount ng bayad nila, pero my computation na ng taxes na need bayaran.. at nakakaloka, binigyan kami ng two options, isang mas mataas n babayaran at isang binabaan ng around 3 percent ..whew..
2. yung mga "lazy inheritors" ay hindi talaga "lazy" in the real sense of the word. Marami lang po sa kanila ang walang pambayad sa Estate Taxes, at kung anu-ano pa pong ibang klase ng fees and taxes, para sa transfer ng title sa pangalan ng mga heirs. Idagdag pa ang layo ng locasyon ng namana. Kailangan mo munang umalis sa trabaho upang makasunod sa pinapatupad na proceso ng gobyerno, na kadalasan naman ay nakakalito sa common tao. 3. Don't forget sir that there are Land grabbing syndicates who have ties with officials of LRA and Register of Deeds. 4. These seemingly rigid requirement of the Register of Deeds are the causes of fraud and anomaly in the registration of real properties. It is almost impossible for poor landowners to effect the transfer of title to them! 5. Ha ha funny how you started your cycle, BIR payments agad... 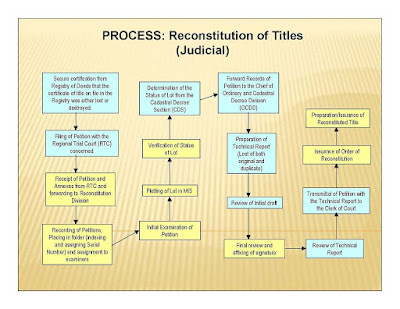 The cycle actually starts from acquiring a certified true copy of the title from RD, then Municipal level, then provincial level, then BIR, then the Register of Deeds,,, after this good luck on how soon you can get your title, unless you know somebody from Rd so that release of the title can be expedited!!! I also commented that it's a good experience for Floro. And we may wonder why many people are still enamored with "more government intervention/regulations" mantra. Someone said that the purpose of government is to expand government. Somehow this is true. And that explains why I and other friends campaign and advocate for minimal or limited government, more market competition, more civil society role. 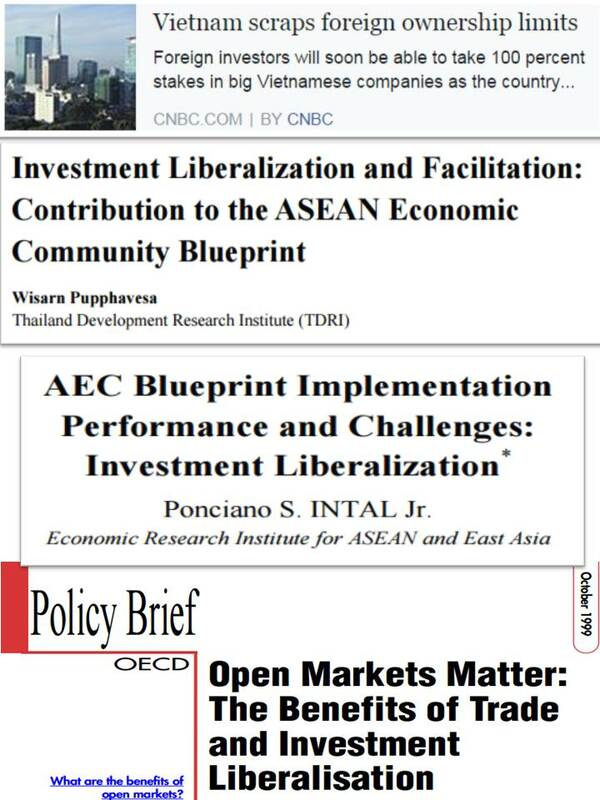 How popular online are free market sites and blogs based in the ASEAN? 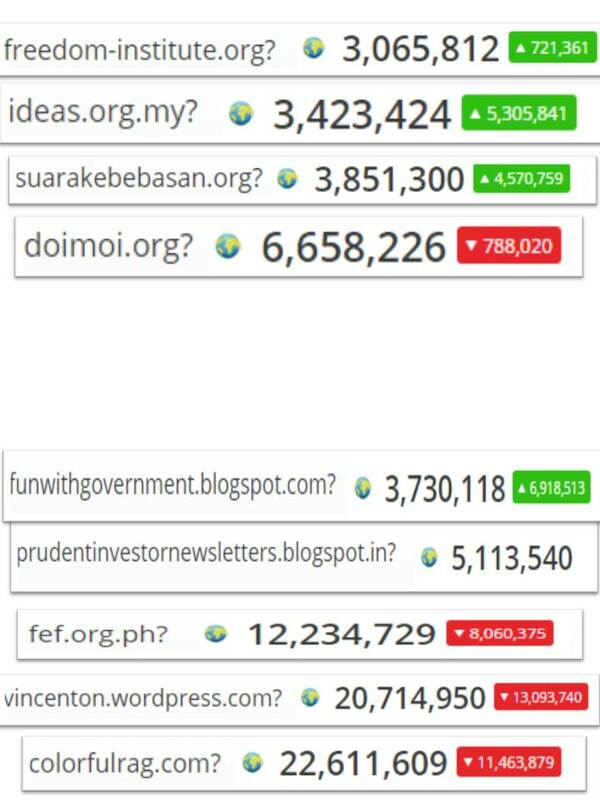 Here is one answer -- the global ranking (via alexa.com) of some known free market websites and blogs in the ASEAN. 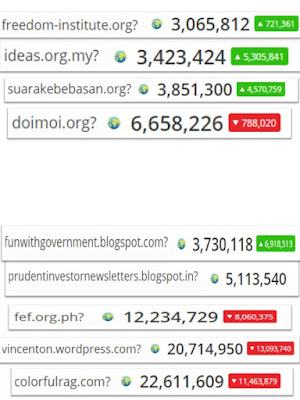 Screen shots I got today Above lists are those from Indonesia, Malaysia (IDEAS) and Vietnam (doimoi.org). Lower list are those from the Philippines. Hmmm, we seem to be stuck in middle ranking trap for several years now. Nonetheless we are still around, not raising the white flag against ever-expanding, ever-rising governments. There seems to be high interest in PH news recently, especially starting October 2014 until today. 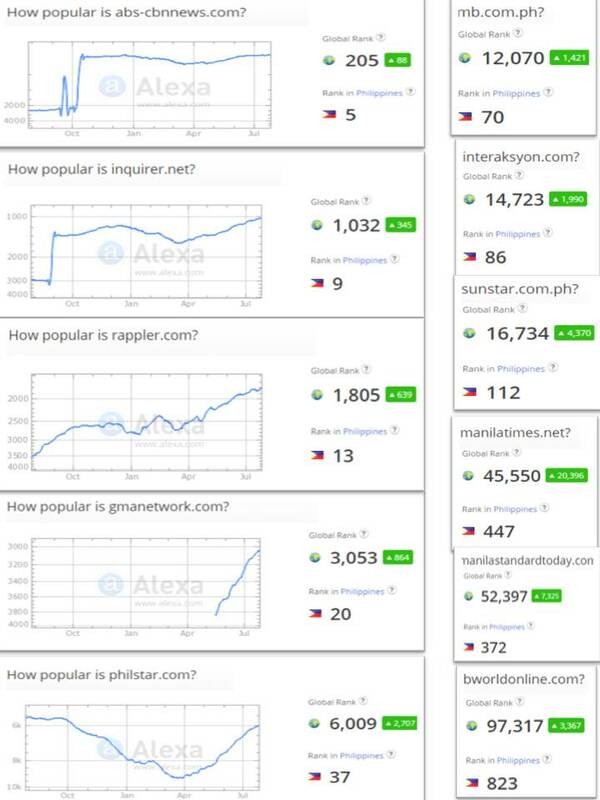 See global ranking of ABS-CBN News, PDInquirer and Rappler. Screen shots taken today from alexa.com. Note also the jump in global rank over the past 3 months -- all in green, meaning an increase in ranking. Decline in ranking is red, none of the listed media outlets here experienced red marks recently. 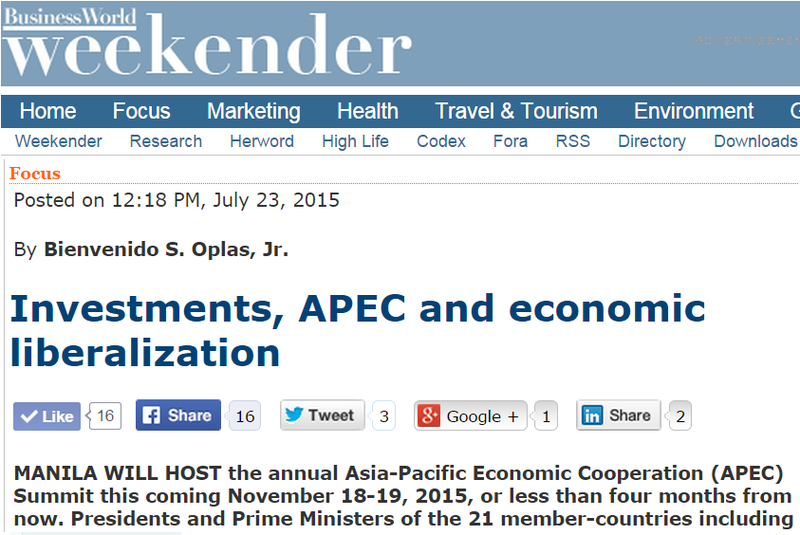 Maybe this is related to the PH's recent higher GDP growth rate, improvement in credit ratings, etc. More and more people around the world are reading and browsing about the Philippines. 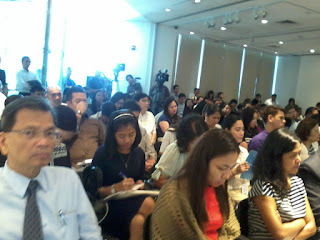 Or there are more Filipinos living and working abroad, and they are following news back home regularly. Whatever the explanations are, this is somehow good news -- the Philippines rising in the global radar of business, politics, etc. * This is my article yesterday in BusinessWorld's Special 27th Anniversary Report, coinciding with President Aquino's 6th and last State of the Nation Address (SONA). PRESIDENT Benigno S. C. Aquino III will deliver his 6th and last State of the Nation Address (SONA) today, and it is a relatively safe guess that its general outline will be a report of achievements over the past five years and what the administration intends to achieve in its final 11 months. 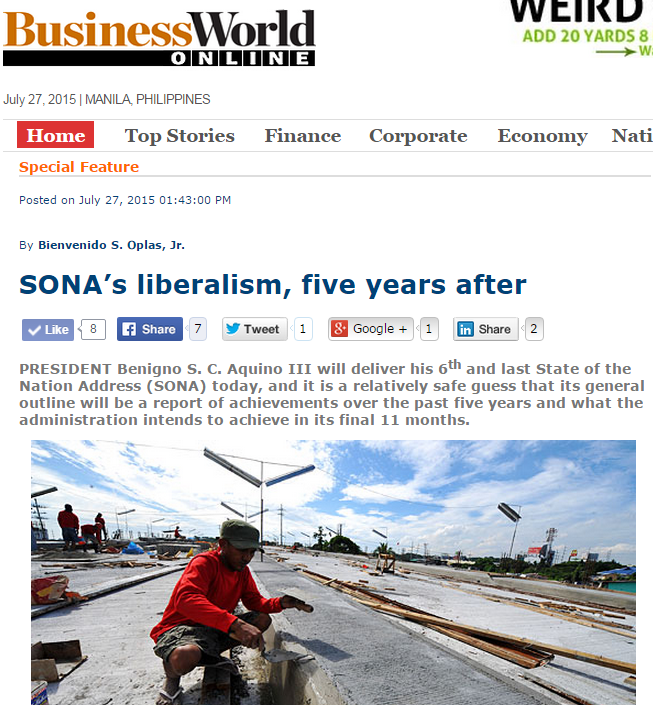 Reviewing the past five SONAs, 2010 to 2014, it appears that in his first SONA in 2010, the President wanted to affirm the liberal ideals of a limited and clean government, dynamic market, and principled civil society. The President is from the Liberal Party, not from a nationalist or socialist party and somehow, those ideals should be reflected in his policy formulations. The succeeding SONA from 2012 to 2014 focused more on the various welfare and subsidy programs of the administration, especially the implementation of the conditional cash transfer program. Liberalism in theory is not focused on heavy state welfare and political populism as these are the realm of socialism and conservatism. Liberalism is about having rule of law, government as enabler, judge, and policeman of the people’s three basic rights and freedom -- right to private property, right to life against aggressors, and right to liberty against dictators and bullies. The four items above are consistent with liberalism, of lesser government intervention and more private enterprises involvement and dynamism. Also the two (and more) legislative measures. After five years, from July 2010 to July 2015, were those four (and more) plans and promises fulfilled? Were those legislative proposals enacted into laws? So it is true, after five years, the Philippines’ overall global ranking in “Ease of Doing Business” has improved by 49 notches. In particular, to start a new business, there is a reduction of 18 days and to get construction permits, there is a reduction of 109 days, after five years. These are good improvements. Mr. Coloma also mentioned the Civil Service Commission’s (CSC) Citizen’s Satisfaction Center Seal of Excellence, wherein government offices are rated by the public through a Report Card Survey. Apparently, Item #s 1 and 2 in SONA 2010, the expressway to Cagayan Valley and rental of Navy HQ in Roxas Boulevard, did not take off. Item #3 on BOT seems to be on track as there are plenty of big PPP projects that are on-stream or being implemented. These include the North-South Railway Project, NLEx-SLEx Connector Road, and NAIA Development. PPP projects for approval include LRT Lines 4 and 6, and the Batangas-Manila (BatMan) 1 natural gas pipeline project. The proposed Whistleblower’s Law is still pending in Congress, and it is hoped that it will become law before the end of Mr. Aquino’s term and of the current Congress. We also asked Mr. Coloma why Mr. Aquino doesn’t seem too enthusiastic in the moves to amend the Constitution and remove economic restrictions like the prohibition or limitation of foreign investments in certain sectors and sub-sectors of the economy. Mr. Coloma said “the President has adopted a hands-off stance so far, [is] not against it but reasonably open to it.” He added that the President is just being careful because Congress might interpret it differently and this might lead to a comprehensive amendment of the charter, not just the economic provisions. Looking up to SONA 2015, what would be the outlook for the Palace in the next 11 months? Mr. Coloma expressed the hope that certain priority bills would become law, like the Rationalization of Fiscal Incentives, the Tax Incentives Management and Transparency Act, and others. He also pointed out the continuing need for good governance, transparency, and institutional moorings. It should be noted that there is more emphasis on “good governance” by the Palace as the political heat leading to the 2016 presidential election rises. The liberal ideals of limited government and, by extension, “less governance” has been muted. The political opposition and militant civil society do not show any interest in limited government. On the contrary, they show voracious appetite for further expansion of government, provided that they are the ones occupying high government positions. Between a liberal government with muted aspiration for more market competition and a political opposition with expressed desire for a more welfarist, more populist and interventionist government, the public have a choice. If they wish to see a more dynamic, more competitive private enterprise, they should call for less governance. If they wish to try a welfarist, interventionist government system, the case of Greece and its huge debt and fiscally unstable economy should be a gentle reminder of the danger of this option. 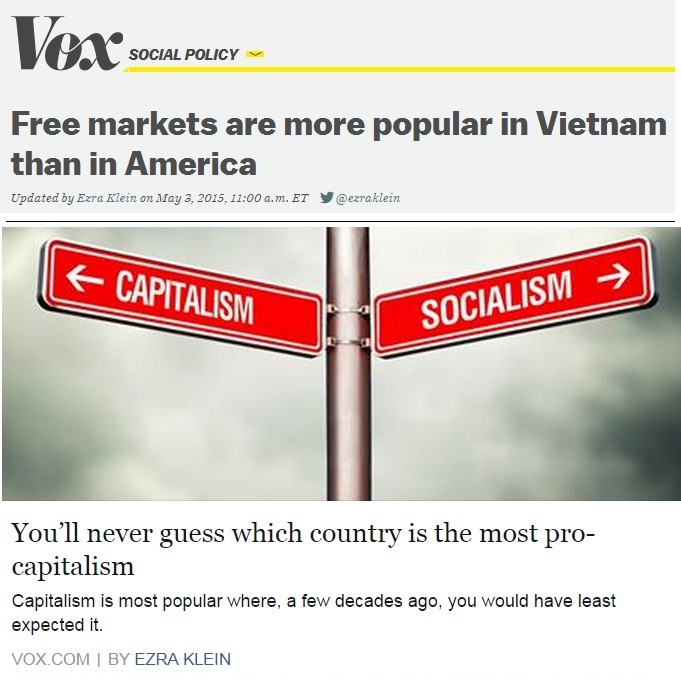 There is an interesting report in vox.com, covering the recent result of Pew Research survey on Support of the free market system. People in socialist Vietnam and China have high support for free market capitalism and its inequality than people against it. 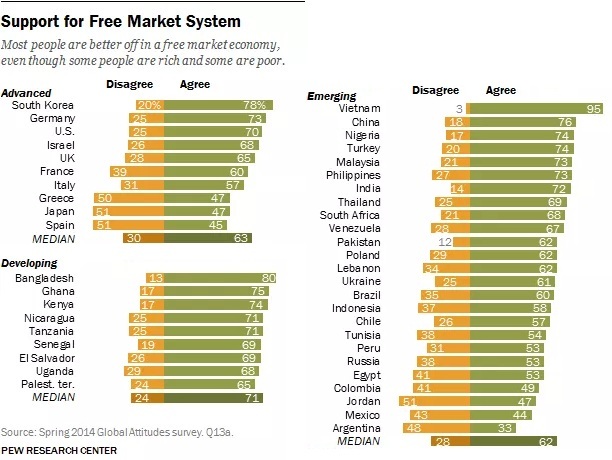 Also high support of people in Nigeria, Turkey, Malaysia, Philippines. Pew's survey question was, "Are people better off in a free-market economy given the wide disparities in wealth that might result?" Agree or Disagree. 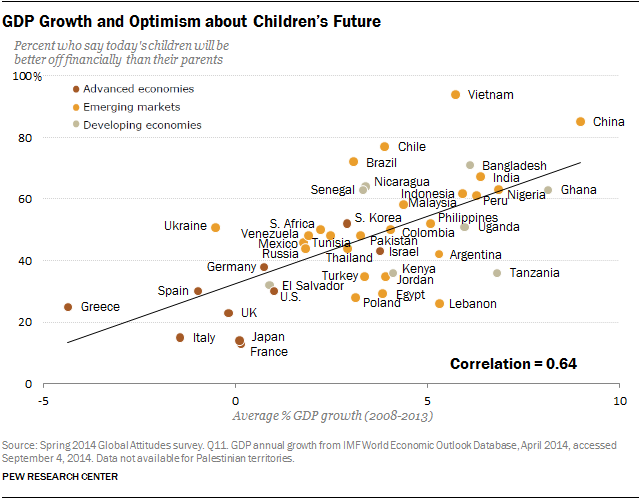 And another interesting chart from that report -- optimism of people who say that children will be better off financially than their parents, socialist Vietnam and China are again outliers. People in Chile, Brazil, Bangladesh and India are catching up to the optimism. In a related thread on inequality and "inclusive growth", I argued that inequality is good. Up to what level of inequality, like gini ratio? There should be NO ceiling on the degree of inequality. There is no way to stop some people from being too intelligent or too efficient and too hard-working + some luck. Almost all the things that we so enjoy -- facebook, youtube, google, laptops, cars, airplanes -- were created by very intelligent, very hard-working and efficient people, and they have become super rich. And we benefit from them and their invention. So why put a "cap" on their wealth? More inequality, the better for society and humanity. Notice also that the richer they become, the more that they give away their wealth. From Bill Gates to Warren Buffet to Zuckerberg, they all have foundations or donate to foundations whose main business is to give away their wealth via charities. I think the endless call for forced equality is simply driven by envy. The role of government should be limited only to setting fair rules for everyone, ensuring the rule of law. To have equality before the law, equality in opportunity for everyone, but NOT equality of outcome, like those endless calls for forced equality via endless subsidies and welfare programs and endless taxation of the rich. On the other hand, there are people who have zero ambition in life except to eat and drink/party, 5-7 days a week. Even if government will give them $2,000 a month in various subsidies, they will remain poor as they will simply spend $2,100 a month or more and be in debt, the money is spent on interest payment and other wastes, forever. “there must be a LIMIT as to the wealth you can generate." Huhh? An anarchist advocating zero government now advocates "LIMIT to wealth"? The one that will enforce that limit is government, via endless taxation, fees, penalties, mandatory contributions, etc. And guns and prison if they evade those endless taxation. Capital, like labor and technology, simply wants to be mobile across islands, provinces, countries and continents. They are like migratory birds and large fishes/mammals, they go to areas that are hospitable to them, allow them to survive and flourish. Economies that are more open to global trade tend to attract more foreign direct investments (FDI), like Hong Kong and Singapore, but Japan has a different story. 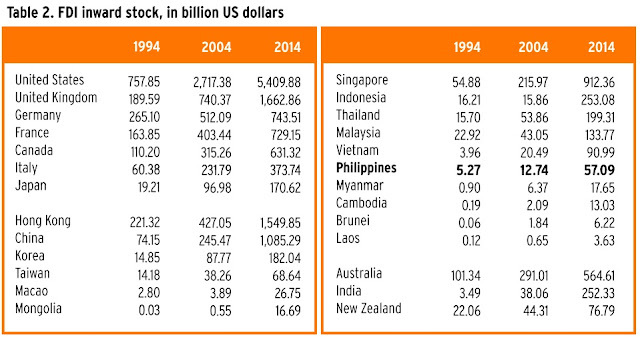 Data is from UNCTAD, World Investment Report (WIR) 2015, http://www.unctad.org/fdistatistics. This table is from a paper produced by my sister's auditing firm. I will blog about it soon here. Meanwhile, here are some reports and papers on the subject. "The announcement gave few other details, although it said industries such as banking that are covered by separate rules would keep ownership limits at 30 percent." Foreign investments should be liberalized. It is unfair for employees and those looking for new work that the number of investors and job creators in the domestic economy is limited and restricted mainly to local investors. What usually happens is that if they cannot be hired by foreign investors in the home country, they are hired by foreign investors in foreign countries through the process of migrant employment, like our OFWs. So there is no sense keeping the investment protectionism policy. 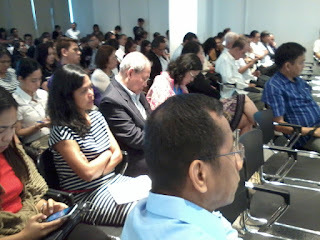 Last Thursday, July 23, I attended this forum held at the Ayala Museum, Makati. 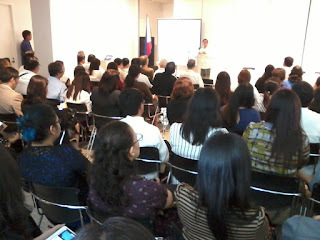 Main speaker was Atty. Raphael Perpetuo "Popo" M. Lotilla, former DOE Secretary and Chairman, Center for the Advancement of Trade Integration and Facilitation (CATIF). 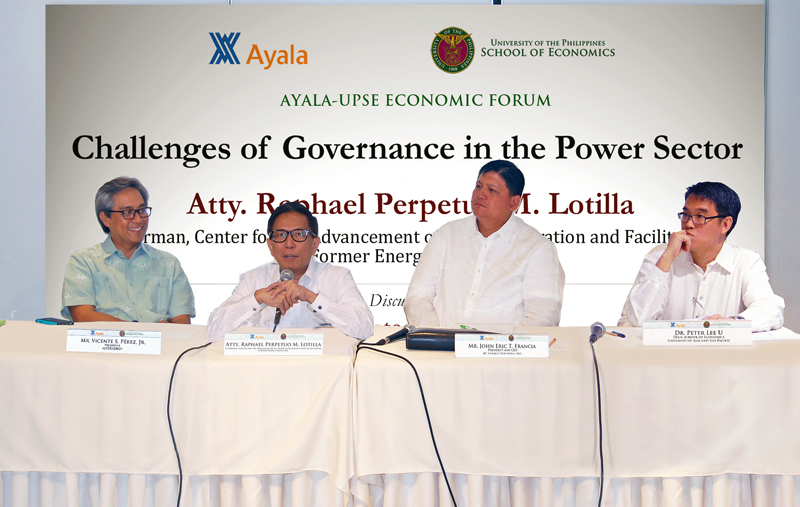 Discussants and reactors were (1) Mr. Vicente S. Perez, Jr., former DOE Secretary, President of ALTERNERGY and Chairman of WWF-Philippines, (2) Mr. John Eric T. Francia, President & CEO of Ayala Corp. (AC) Energy Holdings, Inc., and (3) Dr. Peter Lee U,Dean, School of Economics, University of Asia and the Pacific (UAP). This photo from the UPSE website; from left: Perez, Lotilla, Francia, Lee U.
Popo talked about the various provisions of the Electric Power Industry Reform Act (EPIRA) law of 2001, in particular the Retail Competition and Open Access (RCOA), the Energy Regulatory Commission (ERC), Wholesale Electricity Spot Market (WESM), etc. During the open forum, I spoke, I said that I agree with the speakers that EPIRA does not need amendment or abolition. It's the renewables cronyism law, Renewable Energy (RE) Act of 2008 that needs amendment or abolition. Vince Perez and others in the audience I think raised their eyebrows and wondered, so I repeated it's renewables cronyism. In particular, the feed in tariff (FIT) and renewable portfolio standards (RPS) provisions. FIT is guaranteed minimum price for 20 years. In classic and orig capitalism, there is no such thing as "guaranteed" price and profit. Prices rise and fall due to dynamics in supply and demand. If there are lots of power plants running at the same time relative to power demand, the price shd go down. By how much, well down to P0.50/kWh perhaps during midnight or long holidays. RPS is mandatory use by the national grid through NGCP. Thus, if good wind comes in at midnight, wind power produce more power at P8+/kWh (FIT priice) but coal can also provide power at P0.50 or P1/kWh that same time, NGCP is arm-twisted, coerced by the law to take the more expensive wind power and reject cheaper power from coal on that hour/s. That is hypocrisy. We should have cheap electricity because we already have the 2nd or 3rd most expensive electricity in Asia. Yet RE law mandates more expensive electricity on top of already high prices. Then I specifically asked Vince about my opinion that he has conflict of interest in the sector. He is the Chairman of WWF-PH that explicitly lobbied for FIT/expensive electricity implementation, and his companies benefit from those FIT and RPS. RE law was enacted in December 2008 but FIT was implemented only by mid-2012 because many sectors and energy consumers opposed even more expensive electricity. Two more questions from the floor, one about nuke power. Then Popo replied to the two questions. Vince replied to my question that he has no conflict of interest because RE law was enacted when he was no longer the DOE Secretary. I did not make a follow up question because there were many other hands raised to ask questions or make comments. Vince simply did not answer my question and my point above I think, remains valid. 1. It allowed privatization of losing, low capacity National Power Corp. (NPC) power plants, especially hydro. 2. This drastically reduced NPC losses and public debt, before something like P100B or P150B a year, NPC has near-zero capacity to pay those ever-rising debt, it can only add and exacerbate it. Who will pay those huge NPC debts? You, me and our children through taxes and more taxes. 3. It allowed more players, more competition in the power generation sector. Before, there was only NPC, Lopezes and some Aboitiz power. 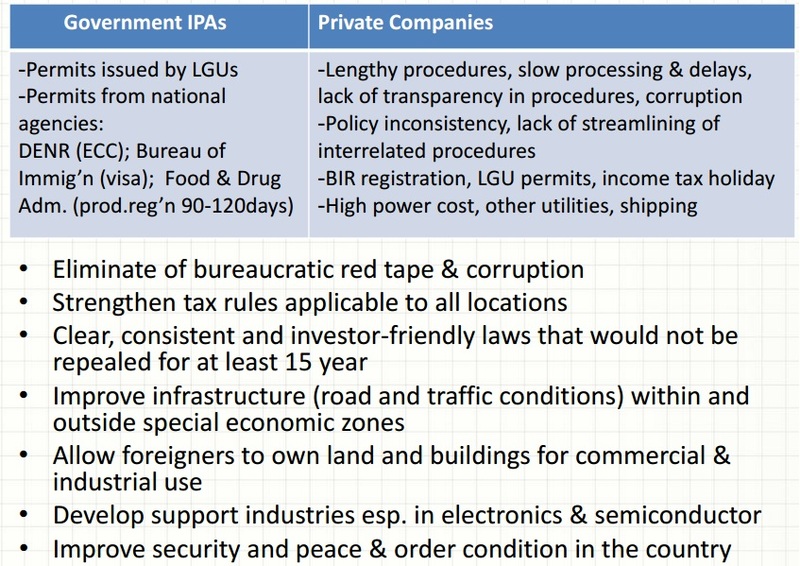 Now there are San Miguel, Trans Asia, KEPCO, SN Power, GN Power, AES, AC, Salcon, GBPC, and about dozen-plus others, aside from the Lopez and Aboitiz companies. 4. It allowed retail competition and open access (RCOA). If you have a 1 MW power plant, say a small hydro in Montalban or Marikina, and some villages in Marikina or UP-Ateneo area want to buy your power output, you can bypass Meralco, bypass NGCP, etc. You pay fewer fees (no transmission fee, no distribution fee, no universal charges too, I think). 5. Compare Mindanao hydro, ALL are still under the government/NPC, and they have frequent "Earth Hours" there. In Luzon, almost all hydro plants were privatized, government made money from privatization proceeds which helped reduce the public debt, while improving the capacity factor of those plants. Ex. Magat hydro in Isabela, 360 MW. Under NPC, it would be VERY lucky if it can produce 300 or even 250 MW. When Magat was bought by a Norwegian power company in partnership with Aboitiz power, its capacity went up to 100%, full 360 MW. The Norwegians are perhaps #1 in the planet when it comes to hydro power tech. Later, Magat's capacity even improved to 380 MW. Private power plants, if they run too low against their capacity, will be losing money, something they cannot afford. On the other hand, losing power plants under NPC was not so much a concern of NPC officials and employees, they were assured of funding (their salaries, travels, trainings, etc.) from the budget, yearly. After the forum, meals. 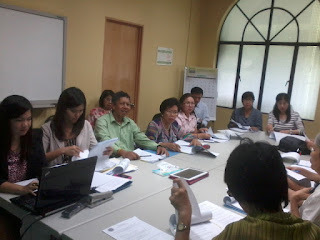 From left: Prof. Ruperto "Ruping" Alonzo, retired UPSE faculty and former NEDA Dep. Dir. 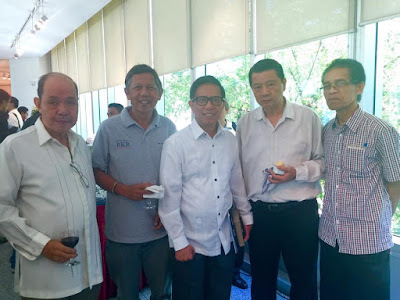 General, me, Popo Lotilla (a former dormmate at Narra dorm, UP Diliman in the 80s), Simplicio Endaya, a fellow UPSE alumni, and Dr. Epictetus "Lingling" Patalinghug, Prof. at UP Coll. of Business Administration, trustee of ADR Institute. I also talked briefly to Eric Francia. I think I told him that the Ayala Corp. (AC) should not ask for energy subsidies. He replied that they have a diversified energy sources of power generation. The main reason why AC should NOT ask for subsidies (Eric, Romy B., feel free to forward this to Mr. JAZA :-)) is that AC is a net energy consumer, not energy producer. Its core business is real estate, those expensive and glittering malls, residential and office condo, sprawling expensive subdivisions, etc. Thus, it should lobby for cheaper electricity, not expensive power. When it develops renewables like wind and power and get subsidies, it is contributing to more expensive electricity. The Ayalas (unlike the other big Spanish families and hacienderos) were able to build their huge business empire because of innovation, not because of political cronyism. So why would it ask for renewables cronyism and favoritism now? They can develop renewables like putting up solar roof on their malls like what SM North Edsa has done, mainly to augment their power needs, or part of their CSR publicity, WITHOUT asking for subsidies. I heard that they lobbied for retroactive FIT for an old wind farm they bought but was built before RE law (RA 9513) was enacted in 2008. Will check how true is this story. Ok, that "subsidize renewables to save the planet" and "man-made" warming/climate change drama. 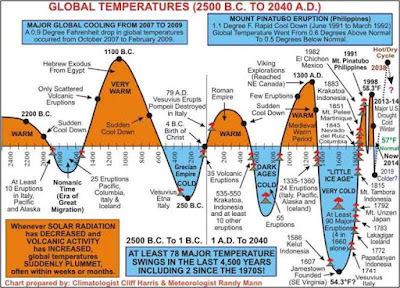 Here's the chart again of planet Earth's long-term climate history. The campaigners and lobbyists of "more expensive electricity to save the planet" are of course dishonest. The UN, Al Gore, WWF, Greenpeace, Oxfam, etc. They make huge money by fooling the public, and they get more donations from the public, more tax money from governments. 4. Less rain or more rain, less flood or more flood, less storms or more storms, less snow or more snow, less dogs and more dogs, they are all proof of "man-made" CC. So ALL those alibi and drama for expensive electricity via subsidies to wind and solar "to save the planet" have no justification. Trivia: I knew that the forum would be on July 23, but I thought it was at 1:30pm, so I went to the office that day in polo shirt, jeans/maong and rubber shoes. When I checked again the event around 9:20am, it said the program would start at 9:30am! No time to go home to change dress and shoes, I went there in the most casual, informal attire. I arrived when Popo was already speaking, just stood at the back. Later I sat in the front chairs, beside NEDA Dir. Gen. and my former teacher in UPSE, Dr. Arsenio M. Balisacan. A lot of the discussions in the Philippines and other Asian countries focused on the ASEAN Economic Community (AEC), the Trans Pacific Partnership (TPP) and the Asia Pacific Economic Cooperation (APEC). 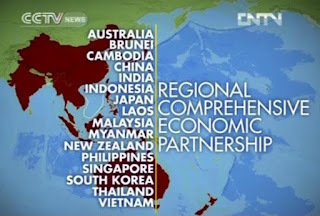 Lesser known but equally important is the Regional Comprehensive Economic Partnership (RCEP), composed of 10 members ASEAN + 6 (Japan, China, S. Korea, India, Australia, NZ). The goal is to have the free trade bloc formalized by end of this year. Perhaps one reason is that while TPP is US-led, RCEP is said to be China-led and given the negative image of China over the territorial disputes in the SCS/WPS, human rights issue, there is less enthusiasm by the public to be so engaged with them. 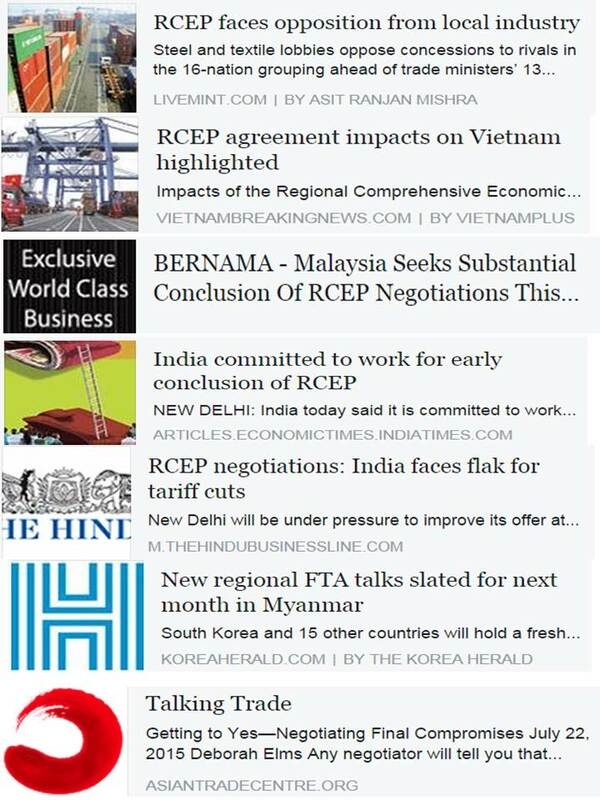 I am reposting some recent news in the region about RCEP. Thanks to @RCEPNews for these leads. "“We are facing a lot of opposition from domestic industries, especially from the steel industry, against opening up the sector for competition. Our domestic steel price is $50 (per tonne) more than international prices. How is this acceptable? We are telling the steel industry don’t say the entire steel sector should be out of RCEP. We are asking them to give us a few tariff lines where we can negotiate. But they are adamant. We have to give somewhere to get somewhere else. If India will become too conservative and protective, we will be out of the race. Ultimately, it is going to be a call taken by the Prime Minister’s Office,” a government official said on condition of anonymity. 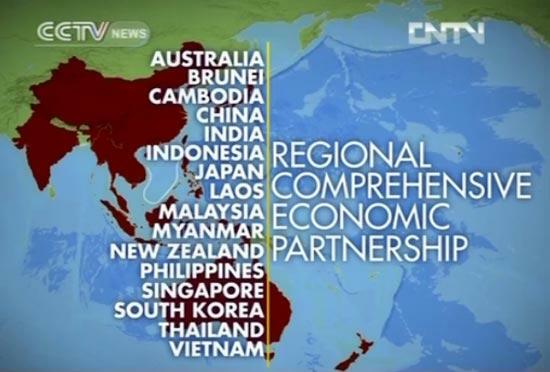 "Speaking at the conference, Vice Director of the Central Institute for Economic Management (CIEM) Vo Tri Thanh highlighted that RCEP is relevant to Vietnam’s outlook on fostering economic integration with comprehensive economic reforms. Pham Binh An, Director of the WTO Integration Support Centre in Ho Chi Minh City, said the RCEP pact stipulates drastic reductions on trade tariffs, which will have major positive influences on Vietnam as the country is experiencing a trade deficit with some of the regional nations. "International Trade and Industry Ministry Secretary-General Tan Sri Dr Rebecca Fatima Sta Maria said a comprehensive closed door meeting, that will gather all 16 countries involved in the RCEP, would be held this Monday. 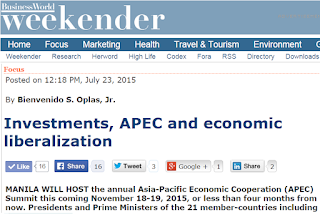 "The RCEP is an important negotiation for the region. We are trying to see where the bloc is and what we can do to progress this," she told reporters on the sidelines of the ASEAN Senior Economic Official Meeting (SEOM) here Friday." July 10, 2015. "Commerce and Industry Minister Nirmala Sitharaman is in Kuala Lumpur to attend the Regional Comprehensive Economic Partnership (RCEP) inter-sessional ministerial meetings. "India has got “singled out’’ for offering the lowest market openings in goods at the recent ministerial meeting of the 16 countries negotiating a regional comprehensive economic partnership (RCEP) pact. It is under pressure to improve its offers substantially. New Delhi also conceded to the demand of RCEP members, including the 10-member Asean countries, China, South Korea, Japan, Australia and New Zealand, to agree to a separate group on e-commerce that will hold its meeting early next month, a Government official told BusinessLine. ""There is a sense of urgency for a deal among the participating countries as they have set a deadline for negotiations at the end of the year," Deputy Trade Minister Woo Tae-hee told a regular press briefing. "The countries are making considerable efforts to move their negotiations forward," he added. Woo, however, noted the countries were still at the stage of setting a guideline or modality for market liberalization under the envisioned free trade pact, which need to be followed by a possibly more strenuous process of drawing up a list of products to be liberalized for each country taking part in the multilateral negotiations." July 21, 2015. "RCEP officials are at risk of eating a lot of cheese (or a mountain of dough) on their hypothetical pizza. 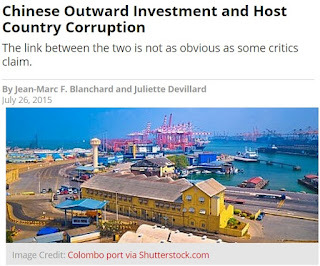 Great article here by Dr. Debora Elms of Asian Trade Center (ATC) in Singapore. 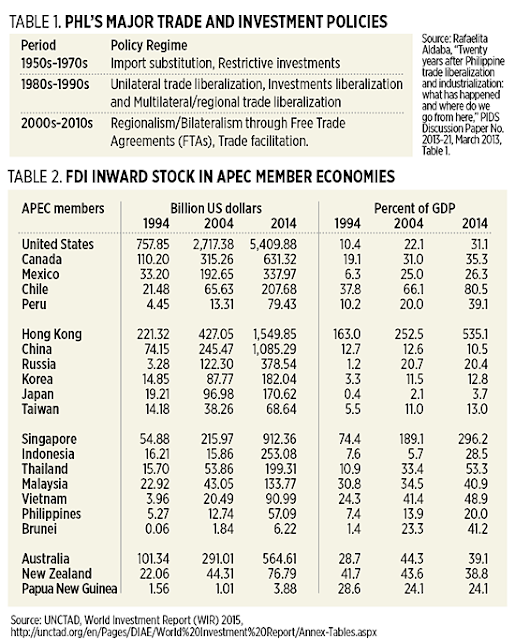 China already has 12 existing FTAs including China-ASEAN FTA and China-Korea FTA. Now with 7 on-going negotiations including RCEP, China-GCC (Gulf Cooperation Council) FTA, and China-ASEAN FTA Upgrade Negotiations. 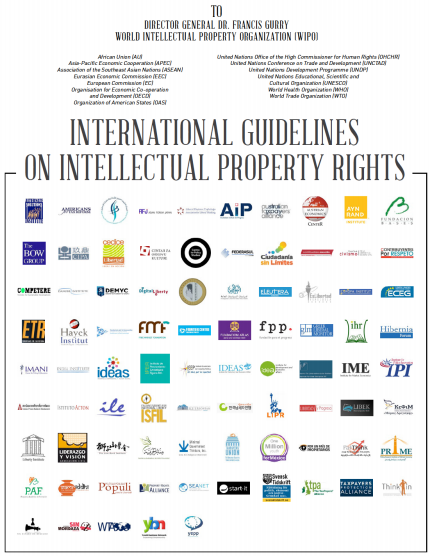 Last night, today in the US, a coalition of 85 independent think tanks and institutes from 51 countries, led by the Property Rights Alliance (PRA) sent a letter to World Intellectual Property Organization (WIPO) Dir. Gen. Francis Gurry, about International Guidelines on Intellectual Property Rights (IPR) protection. 1. Rule of Law, Property, and a Transparent Political Environment are the Foundation of Fair and Prosperous Societies. 2. Intellectual Property Rights are Affirmed in International Treaties as a Human Right. 3. Intellectual Property Rights Promote Free Speech and Expression. 4. Intellectual Property Rights are Integral to Consumer Protection and Global Security. 5. Strong Intellectual Property Rights and Contractual Freedom Promote Free and Competitive Markets. 6. Intellectual Property Rights are Vital to Economic Competitiveness. 7. Intellectual Property Rights Must Be Protected Through Effective IP Provisions in Trade Agreements. 8. Intellectual Property Rights Must Be Respected and Protected on the Internet. 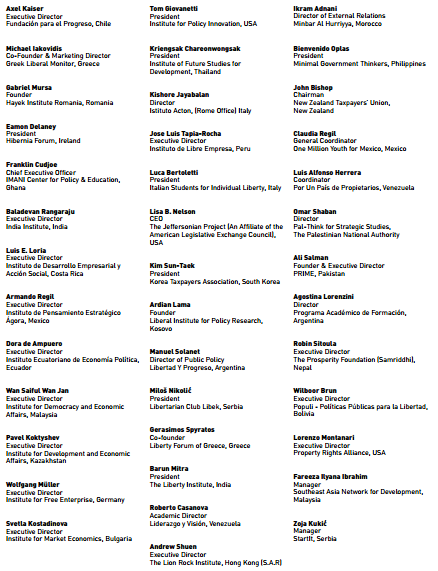 Minimal Government Thinkers is among the 85 co-signatory organizations and think tanks. Among fellow Asian free market leaders who also signed and supported the statement are Wan Saiful Wan Jan (IDEAS, Malaysia), Fareeza Ibrahim (SEANET, Malaysia), Kriengsak Chareonwongsak (Inst. of Future Studies and Development, Thailand), Andrew Shuen (Lion Rock Institute, HK), Feng Xingyuan (CIPA, China), Kim Sun-taek (KTA, Korea), Barun Mitra (Liberty Institute, India), Robin Sitoula (Samriddhi, Nepal), Ali Salman (PRIME, Pakistan), and Raza Ullah (Alternate Solutions Inst., Pakistan). We encourage you to consider these guidelines as you review and discuss new and existing treaties, laws and regulations governing IP. Advanced societies have long understood that by protecting the proprietary rights of artists, authors, entrepreneurs, innovators, and inventors, they were promoting the greater public welfare. The continued protection of these fundamental rights is essential to globalinnovation, creativity and competitiveness. Thanks to Lorenzo Montanari, Exec. Dir. of PRA, for initiating this important letter, available here. I also reposted it in my slideshare account. Heavy traffic in many areas of Metro Manila is a daily reality. Here for instance, Roxas Blvd. in Pasay near the Baclaran Church. I took this one Saturday morning last month, I was on a pedestrian overpass. Because almost everyone experiences heavy traffic, then almost everyone has a proposed solution how to solve it, which is not really a bad thing. What makes things bad is when some people would propose solutions that will impose more restrictions on the rest of society. Like (a) prohibiting people from driving and using their own cars one day a week (aka plate "number coding" ban). Or (b) prohibiting certain modes of transportation and ride sharing (air-con vans, some provincial buses). 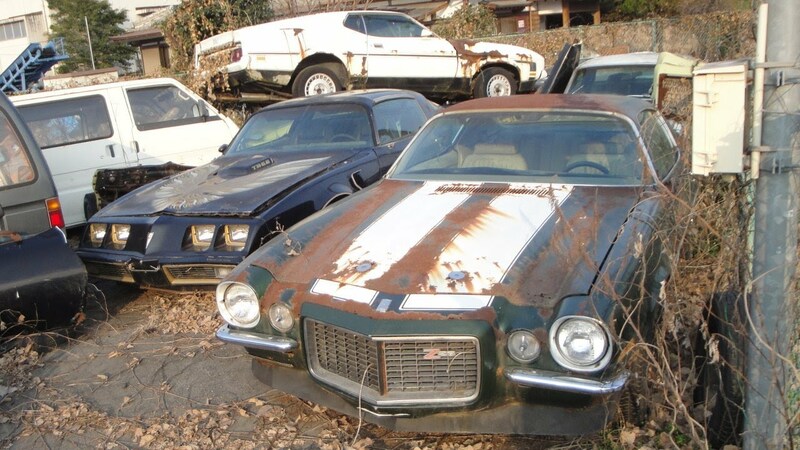 One solution proposed by some people and represented by these old, abandoned cars, is that we "bury our irrational desire for more private vehicles, have more space for mass public transportation," and "moderate our greed for cars." People respond to incentives and disincentives. When government imposed that we cannot drive/use our car, our own private property, one day a week, some people who can afford started buying a second car, or at least a motorcycle. Again, if you live in UP Village, or Filinvest QC, and you are going to Makati CBD or Ortigas , if you take the public transpo, it's four rides one way: (a) tricycle from house to Commonwealth ave or Philcoa, (b) jeep to MRT station, (c) MRT ride, then (d) jeep or van to destination. Coming home, the same four rides, or eight rides a day. It may be cool if one is wearing shorts and rubber shoes, but if wearing barong or corporate attire, carrying a laptop and other important docs, or big cash, would you dare taking those 8 rides a day? Most likely not. So people endure driving their cars even in heavy traffic. But other people should not blame the hapless middle class motorists who refuse to be harassed with 8 rides a day. That's unfair. Those who wish to endure it, fine. Those who don't want to, we should not call them "moderate their greed for cars," and "greed" is defined as having two or more cars. When the MMDA and LGUs prohibited people from driving our own cars one day a week, that is already wrong. But people comply with this ruling, and some buy a 2nd car for coding day of the main car, or when the other car is in a repair shop. But why call them "greedy" for having a second car? Not that I own two or more cars, I own only one, an old one. But I will debate people who say that owning 2 or 3 cars are greedy. What do they know of the circumstances why some households have opted that way, an expensive way? If parents also have to bring the kids to school before going to work, that makes 4-5 rides one way, or 8-10 rides a day or more. This is not nice nor cool. Thus people have to drive their cars. Then there are households with special needs, like bringing a sickly child or grandpa/grandma to regular medical check ups, then the couple must drive to work too, they will need 2 cars at least. Maski luma or bulok basta may air-con and functioning. To condemn them of being "greedy with cars" despite their special condition is wrong and irresponsible. One solution to reduce traffic in Metro Manila and other major cities in the country is to allow various forms of ride-sharing and car pooling, government agencies like LTFRB, MMDA and LGUs should step back from more prohibitions, more regulations, more bureaucratism. People simply want to take one ride from house to work whenever possible. If air-con vans, if Uber system can provide this, why over-regulate and prohibit them? On the earlier proposal by environmentalist lawyer billed as "Akin ang Tondo, Sa Iyo Ang Cavite" -- dividing roads in Metro Manila, 1/2 or 2/3 to cars and buses, 1/2 or 1/3 to bicycles and pedestrians. For me, this is a lousy proposal. You do not mix cars with bicycles and even pedestrians in Edsa, a very congested and major road. Not everyone is careful, whether the cyclist or motorist or pedestrian. If one or more people die in an accident in Edsa, say a novice bicyclist who suddenly swerves to the lane for cars, or a novice or sleepy or drunk motorist who swerves to the bicycle lane, who is to blame? The bicyclist, the motorist, the government, or Tony Oposa and his supporters? 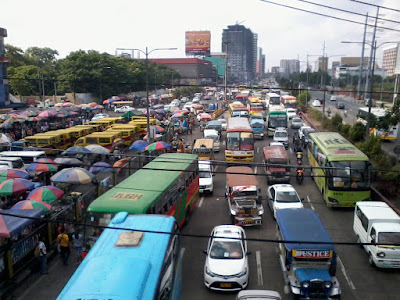 Do NOT mix them in Edsa, it is a stupid idea. Bicycles and pedestrians should have their own lanes, elevated from the main road, so that cars and buses cannot easily swerve onto them.